Everyone loves flowers, no-one more than the team at Red, Eden & Olive. We are dedicated to creating beautiful couture floral designs that transform spaces with extraordinary displays. Renowned for our originality and restrained elegance, skilfully blending art and nature, bringing together blooms of exquisite colour, texture and sculptural detail in highly imaginative designs. Share your thoughts and we will work with you to help create a bespoke event that's exceptional for its visual impact, the ambience it evokes and the memory it leaves behind. From intimate dinners to opulent events, our aim is always the same, to delight and surprise your guests and make them smile. Highly contemporary installations using perspex adorned the event space for this executive forum at The Grove, Hertfordshire. The flowers were graduated by colour in keeping with the event logo message and artwork, whilst also reflecting the art and decor of the venue. A more intimate ambience was required for the closing party, which featured installations of blossom trees. 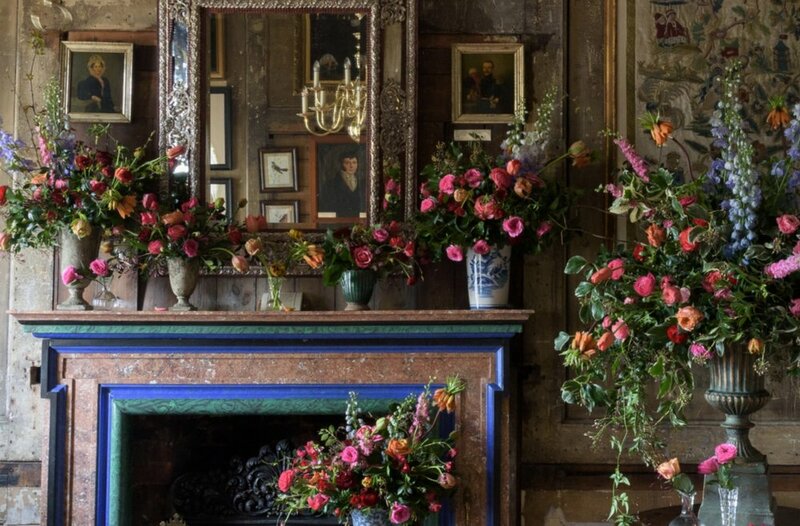 Bringing the statues to life at LASSCO’s as a contribution to the annual Chelsea Fringe Festival using an abundance of seasonal flowers arranged in a variety of lavish designs. 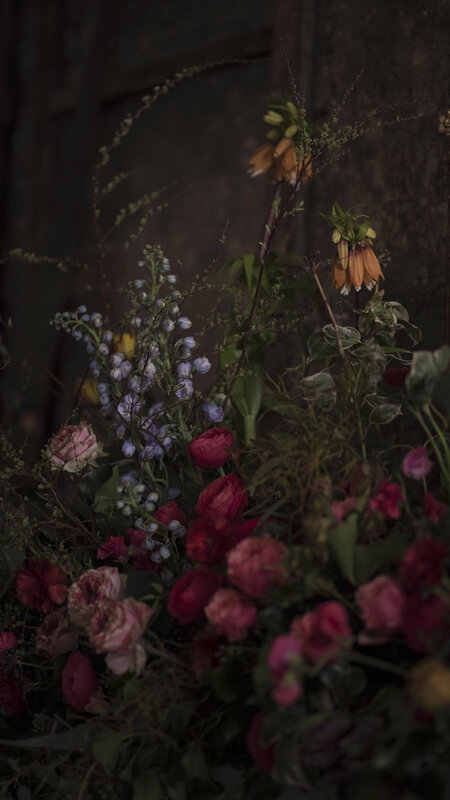 Late summer wild flowers arranged in an unstructured, natural style for this intimate dinner party. The muted colours adding the the ambience of relaxed charm at Brunswick House, Vauxhall. Arguably the most romantic London venue for its faded charm and endless jaw-dropping backdrops.